Sometimes I forget that not everyone knows how to do something or is familiar with a technique. Like attaching snaps, for example. Snaps are easy, easy, easy. And can be used instead of buttons/buttonholes (if you hate sewing those), hand-stitching something into place (which takes time), or because a pattern calls for them. I shared how I made my interchangeable flip-flop back straps (found here), which uses snaps….and then had questions and emails about how to attach a snap. 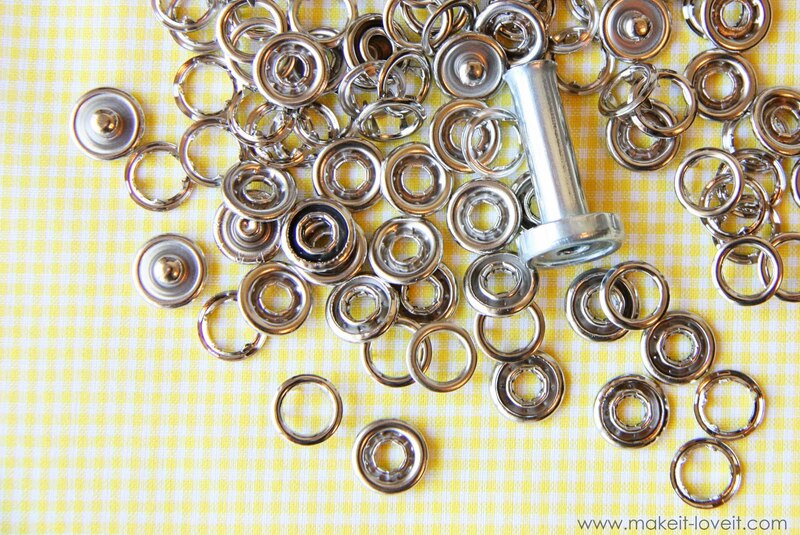 If you have never used snaps before……..you’ll see you’ve been missing out on a simple little sewing invention. First of all, there are 4 parts to a functioning snap. There is a socket and ring prong on one side of the snap and a stud and ring prong on the other side. And my tool of choice to attach the snaps? The Hammer Tool. Below, I have attached two sets of snaps………and just need one more set to be able to close the fabric together. So, on the top piece of fabric, I place one of the ring prong piece on the top side of the fabric……..
Then, I place the stud piece (or you can do the socket piece first…..doesn’t matter) right on top of the prong pieces poking out. The prongs will fit into the grooves on the under side of the stud (and socket) piece. Then, I place the hammer tool right on top of the stud piece……..
……..and then hammer a few times. This secures the two piece together, clamping the fabric tightly between them. They look just like the ones found here. There are many brands and sizes found in stores and online. I’m sure they all work just fine. 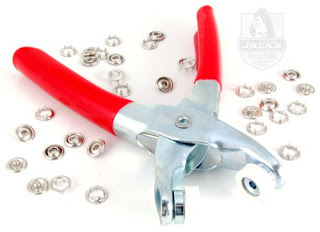 You can also purchase a plier tool that will help you squeeze the snaps into place, without needing a hammer and the hammer tool. I bought one of the plier tools once and it didn’t work right (the prongs weren’t correctly smashed into the stud and socket pieces) and so I never used it again. I returned to my ‘ol trusty hammer tool and have used it ever since. Does that help? And ease your fear of snaps? Now dash to the store and get a few packages of snaps…….you’ll find more uses for them now that you know how easy they are to attach. I did this for my grandfather……buy some simple round magnets……cut circles (small) or squares of material…..sew onto the inside edge of the shirt and slip the magnet in and sew shut. Do both sides of the shirt front. Just make sure you have the magnets facing the right way. I sewed mine tight so the magnets wouldn’t turn when washed and dried. You might try using magnets designed for purses. You can get them online or at a craft or fabric store. I am glad to hear that I am not the only one who had a hard time with the snap "pliers". I think I got it to work correctly, um, once. Oooh, so frustrating! I quickly returned it to the store. I am so going to find one of those hammer pieces! Thanks! I hated those pliers, too. They ruined a few projects for me. I've been afraid to try snaps ever since, but will not go look for the little hammer tool. I'm excited! I LOVE using snaps!!! It's so quick and I do not have to get out my button hole attachment for my machine…I guess I'm lazy like that. I haven't been able to get that plier thing to work properly either! I also went back to attaching them with the hammer tool, so much easier! Thank you so much! I've been intrigued with using snaps lately and not a single employee at the fabric store could tell me how to put them on or what to buy! I'm so excited….to Wal-Mart I go! Ack, glad I'm not the only one who hates the plier too. Annoying. Sonja – Thanks for the link……I may need some in every color now!!! Those pliers make me insane! I've tried the cheapies and the supposedly better ones and they were ALL terrible. Hammer tool is the way to go! I bought the pliars, and threw them away. I thought it was just me. Glad to hear others couldn't use it either! thanks for the tutorial. I've been wanting to try snaps again. I need to find that hammer toool. I prefer the hammer tool too, I was given a plier tool as a gift and it didn't work right, but I thought it was the only option, for years, until I discovered the hammer tool (which is a fraction of the price!) and have been happily snapping since. This was so helpful. Off to Walmart. Thanks. Thank you so much for this post. I have the plier tool and was never able to get it to work correctly so I had given up on snaps. I will definitely try this method instead! I like using snaps too! I think you have inspired me to come up with a little creation this morning. Thank you!! Guess I am the only one who had the opposite experience; couldn't get the hammer and snaps to work at all. Very frustrating. But the pliers worked great for me. But then I didn't have the cool little hammer tool, either. Oh thank you! You've talked about snaps a few times, and they scare me! I was also scared of a magnetic snap for a purse, but once I tried it once it was easy! I need to try these once, and I know I'll be hooked! I'm going to have to try this. BTW, I've always called them male/female snap parts, and I always felt a little weird about that, like it was too graphic, haha! So I'm glad to have learned the terms "stud/socket". Want to know something funny? I randomly woke up this morning and thought how cool it would be to use snaps on a project sometime (no joking) except I didn't know how to do them. Now I totally do! You are the best!! Thanks so Much for this! I've been wanting to make the baby some cute bubble rompers. And they all call for snaps! This info will come in handy. Can't wait to get busy! it DOES ease my fear, thank you! Thank you so much for this post. I was interested in making something that required snaps but never having done it before I was completely overwhelmed just figuring out what to buy. Now I know I can head back to the store with confidence. Thanks again! Hey ~ I think even I can do this!!! :-) Thanks for sharing!! I'm ready to go make something. . . . .anything! I had horrible luck with the pliers too! I tried once and gave up. I need one of those hammer pieces. :) Thanks for sharing!! Hammer tool, huh? I'll give that a try before I finally give up on snaps. I hate, abhore, detest the pliar tool. You know, I have always wondered how to do that. Thanks for posting. Love the blog! Do you ever have trouble with snaps pulling apart later on? I used them on a few baby items that I made and later the snaps would separate. I haven't used snaps at all since then. I just started using snaps and I have had a hard time finding a hammer tool so I just used a spool of thread. I place it over the snap as you have shown with the hammer tool and it works great. I put my snaps on with grommet pliers instead of the ones for snaps. They usually work fine for me, and I only don't use the hammer tool because I'm usually doing this type of thing while my daughter sleeps. I am with you on the pliers! I might have to try grommet ones as one comment suggests! I was using snap tape because I was just too scared to try to do the hammer thingy. Your pictures are great, and your explanation is really helpful! I'm a big fan of snaps in place of buttons. I just have not mastered that whole buttonhole thing! Good to know the little tool works so well. I have the clamps and they have been nice, but like you said, haven't been perfect every time, causing me to ruin snaps. Also, just a thought/idea for you and anyone who might read this comments, if you need colored snaps and you happen to have nail polish already in that color, you can skip going to buy new snaps and just paint a few of the silver ones. It has worked great for me when needed! Thank you from the bottom of my heart for this post! I have been so frustrated by snaps in the past that I usually just switch them out and use velcro instead. (Not so pretty, though). I'm to be really into gothic/industrial clothing and want some my clothing to have grommets or snaps on them. I bought the grommet tool, but haven't been able to get it right. Thank you thank you for the info! I think I wasn't working on a hard enough surface before, and wasn't hammering hard/accurately enough–but now it works! Thank you for this post. In answer to your question ~ I HOPE it fixes my fear of snaps. LOL I figure I've made it to ……well, let's just say over the age of 50 avoiding snaps and really hate that fact. I have been wanting to buy the pliers type snap tool but haven't had the extra money yet because I tried the 'manual' types in the past and gave up. Everytime I've tried I end up with one prong sticking outside the ring they are supposed to be inside. LOL BUT, I have an adorable granddaughter now and a grandson about to be born in Sept so I really want to get over this snap phobia that I have. I hope your well illustrated instructions will work for me. I have not tried the tool you've used so I could try that one. The ones I've tried before were a blue plastic tool and the snaps went in that on either side and then that was hit with the hammer. How exciting. I will have to try this! I just saw a cute tutorial for a baby romper, but wondered what I would do when I got to the directions to apply snaps. Thanks for sharing this. I really had no idea how to attach snaps. I bought some a while back but have nver used them. I am going to try them out! Thanks for the great information! From someone that is new to the sewing/crafting world . . . THANK YOU!! You do a wonderful job at explaining and showing step by step pictures, and I appreciate it!! My machine has been gone for almost 2 weeks (getting cleaned and serviced) and I found your blog a few days ago. I have been itching to sew for the past few days and I finally have my machine back as of today and this snap post seriously made my day. I thought I had to have some king of machine for them. Thanks! Thank you for sharing this. I've always had it in my head that they would be so hard to attach, I was so wrong! I love this tutorial.. Honestly, attaching snaps SCARED me! But I needed to learn this… I have a special needs three year old and I love to make jon jons for him, but I always need snaps because he isn't potty trained yet. So this will help me with my patterns bunches! Haha! You always seem to have the perfect tutorial for what I want to do! I want to use snaps on my nappy wallet and bibs that I'm making but bought the pack and went 'huh'! So thanks a million! :) Looking forward to using them now! I quit using snaps because of those pliers! I need to get one of those little hammer tools. Looks easy. It would sure help in making my doll clothes. Thanks! Seriously?! It's this easy? Why oh why haven't I been making all my baby stuff with snaps? I have been spending so much time on button holes, it's ridiculous! oooh! this is a great tutorial since I want to make clothes for my baby girl!! =) thank you so much!!! 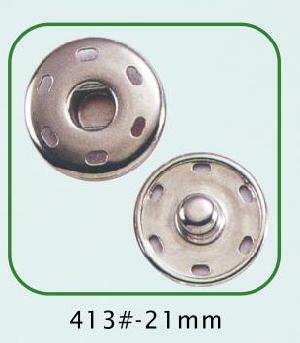 i have to say that snaps still give me fits – as do grommets and any sort of hammer through fabric hardware. the prym kit from wal mart does not come with a silver hammer tool, but with a blue plastic sleeve sort of a tool. i need to find the metal tool to see if i have more success. but you make it look so easy! i still cannot do it properly. THank you! THank you! Thank you! I have been trying to “hammer” without the hammer tool and it’s a disaster!! Will start looking for one and try snaps again! i just find A HUGE BAG of those buttons, and i didn’t get it! :( and they’re were like 7 dlls for like a 100000 or more! hahaha too bad … i will go back to the store… hopefully they will have them!!! Wow. I can’t believe I’m not afraid of snaps anymore. I never thought that would happen! I’m going to buy a kit today!! thank you for this tutorial! i had never done snaps before, saw this and tried them today! super easy! thanks again! best video you will find it was a life saver one night when i ruined 5 bibs in a row with those darn pliers but believe me after watching this video and trying it something clicked and ive done 40 more without one mistake and its faster too!!!!!! Ok I too hate the plier thingys…but neither my walmart or hobby lobby or joanns sell this metal hammer thing..they have a blue plastic chip clip looking thing that you hammer. I’ve even looked on amazon and even googled “prym” and I still can’t find this wonderful metal hammer thingy tool you have?! HELP!! Hi! I have baught three pliers for snaps! None of them worked!!!!! Where can i get this hammer tool? I live in Namibia…..
just got the tool u recommended for the snaps, i really debated about it in the store as they had a few other options, but I went with the one u show here and it works great! so easy! I like how it was the cheapest option, came with snaps to practice with, and works with a variety of size :) Thanks again! Love this, I was always intimidated to do snaps – can’t believe it’s this easy! I visited another how-to site on snaps, which recommended a number of different snap tools. I went for the plastic tool, which was a mistake. (Just because something says “easy” on the package, apparently doesn’t mean it’s true!) I ended up bending most of the snaps that came with it because the plastic tool doesn’t hold the snaps in place well enough. After turning to the internet once again, I found your page and saw that you praised the snap hammer, so I picked one up – NIGHT AND DAY. SO easy with the snap hammer. People – Don’t waste eight bucks on a plastic “easy snap” tool, get the real deal and do it right the first time! where can i purchase a hammer tool? Help!!!! I have onesies that need to have snaps attached. I first tried the size Dritz size 16 ones and they ripped out of the fabric. I thought maybe they were to strong so I then tried the size 15 ones but sadly they seem to be ripping out too. What am I doing wrong? Where can I buy the hammer tool? Is it really that easy? I’m off to go get some in the morning!!! So, I figured out how to use snaps, yay! My question – once in place are they really tight? I made some bibs and it so hard to get them unsnapped I’m afraid it will rip fabric. You have to get nails in there to pry them apart. Any suggestions? you are changing my life, one tutorial at a time. :) Seriously, you will be the person who teaches me to sew. Hi! Can you recommend a brand of snap kit? This is my first time using snaps and I’d like to use something similar or the exact same!! Thx so much!!! statements. Then based on that, decide what will be the best way to handle the accounts and finance of your business. Hard to believe Kamsnaps.com has not been mentioned. These snaps are the best. Haven’t seen a button since I got mine. Where do you get the little ‘hammer tool’ used in this tutorial? I am looking to buy my first set of snaps, but, I don’t know what size to get. They will need to go through a layer of polar fleece&flannel. I am guessing a heavy duty “size 24” would be right. Does anyone have any advise on which size is best?